Transportation is all about the ability to move people and stuff relatively quickly from one place to another in safety and, in the case of people, comfort. In a steady state economy, citizens select from an efficient menu of transportation choices. 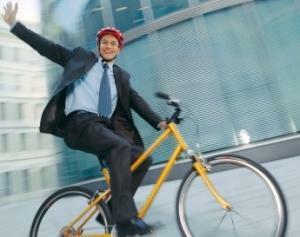 Cycling, the most efficient form of transportation invented by humans, is emphasized. Smoothly operated mass transit systems carry people to and fro in urban centers. Private motorized vehicles are de-emphasized, but are used to provide necessary transport services. Goods are shipped by modes of transportation that require less energy per unit shipped, resulting in less long-haul trucking and more train service. that are efficient, sustainable and fun. 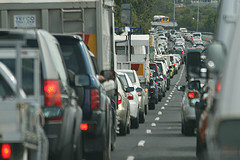 Transportation systems have a difficult time keeping up with the demands of growth. Governments struggle to fund and maintain a growing transportation infrastructure, resulting in more dangerous conditions for people using transportation networks. As congestion increases from more people accessing roads, mass transit, and other parts of the transportation infrastructure, governing bodies have to impose more and more rules and restrictions. Supplying the energy to run an ever-increasing transportation network also becomes problematic, if not impossible. Congestion, brutal competition for energy resources, delays, breakdowns, and safety hazards are the norm in the transportation network when perpetual growth is the goal. A modern economy relies on efficient transportation systems to move people and goods. The challenge is designing a system that provides mobility while limiting congestion, pollution, and use of fuel. Curitiba’s transportation system is rising up to this challenge. 75% of all weekday commuters use the city’s highly efficient bus system. The bus system is designed to move people easily, rapidly and comfortably; it is inexpensive for riders; and it makes new highway construction and private vehicle use unnecessary. As a result, almost 2 million passengers ride the buses each day, and the system has achieved an approval rating of 89%.